Auburn University sprinter Sheniqua Ferguson (middle) accepts the Academy’s 2010 Athlete of the Year Award from Dr. Fred Cromartie, the Academy’s Dean of Academic Affairs, (right) as head track and field coach Ralph Spry looks on. The award presentation occurred at the War Eagle Invitational on Saturday, April 16 at Auburn University. Dr. T.J. Rosandich, the Academy’s Vice President and Chief Operating Officer, is traveling this month to Greece, the Middle East and Malaysia. He will make a presentation at the International Olympic Academy (IOA) in Olympia, Greece, about the Academy’s technology. He will then travel on to Bahrain to formally open the Academy’s Diploma Program before heading to Abu Dhabi to make a presentation for EDRAK, which would like the Academy to develop a college of sport management and run a continuing education program. Finally, he will go to Malaysia, where the Academy has a pending program to retrain 2,000 physical education teachers per year. Board of Trustees and founding member Dr. Robert Block resigned after 39 years of service. Dr. Block served as the first Chairman of the Board of Trustees. Jack Lengyel, Trustee Emeritus, was appointed by Arizona Gov. Jan Brewer to a special Fiesta Bowl panel to restore its reputation and maintain its role as an Arizona showcase. An investigation found questionable spending of the bowl’s funds by its CEO, which has jeopardized its status as a BCS bowl game. Academy National Faculty member Dr. Reginald Overton is currently in Thailand teaching a course in sports facilities and event management. Another national faculty member, Mr. Robert Myers, will teach Seminar in Sports Medicine in Thailand from 23-27 May. The courses are delivered in conjunction with the Sports Authority of Thailand (SAT) and are a part of the Academy’s international certification programs in sports management and coaching. Dr. Overton is a professor in sports management and is Program Coordinator of the Sports Administration Graduate Program at Virginia State University. Mr. Myers is the Director of Athletics and Leisure studies at Hagerstown (Md.) Community College. Betsy Smith, the Academy’s Associate Dean of Continuing Education, attended the USA Sport Safety Athlete Abuse Prevention Summit in Boston, Mass. on 29 April. The summit addressed the sport safety crisis in America with particular focus on the female athlete. The Academy’s 2009 Ernst Jokl Sports Medicine Award recipient Dr. Robert Cantu, who is the Co-Director of the Neurological Sports Injury Center at Brigham and Women’s Hospital in Boston, was the keynote speaker. Guest speakers included National Faculty member Dr. Herb Appenzeller and Dr. Frederick Mueller, recipient of the Academy’s 2007 Ernst Jokl Sports Medicine Award. Duwayne Escobedo was named the Academy’s Editor of Publications in April and will serve as Editor of The Sport Journal, the world’s largest peer-reviewed online sport journal. Ashton Eaton the 2010 Jim Thorpe All-Around Award recipient. 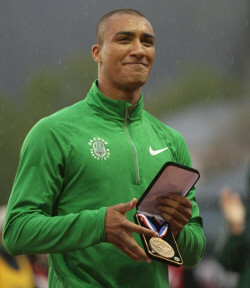 University of Oregon heptathlete and decathloner Ashton Eaton accepted the Academy’s 2010 Jim Thorpe All-Around Award. The award was presented by Oregon Track and Field Coach Harry Marra during an Oregon track meet 6 May. Eaton set the world record for most points in the seven-event heptathlon and was the first athlete to win three consecutive NCAA championships in the 10-event decathalon. Phil Jackson, whose 11 National Basketball Association (NBA) championships are the most by any coach in history, is retiring after a 20-year coaching career. The former L.A. Lakers and Chicago Bulls coach earned the Academy’s 2010 Amos Alonzo Stagg Coaching Award. 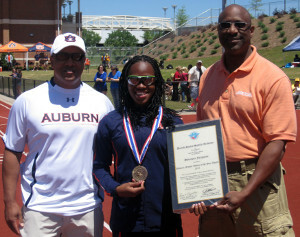 Auburn University sprinter Sheniqua Ferguson accepted the 2010 Alabama Female Athlete of the Year Award from the United States Sports Academy during the War Eagle Invitational Track and Field Meet held on campus April 16. Dr. Fred Cromartie, the Academy’s Dean of Academic Affairs and Director of Doctoral Studies, presented the award.